It is a blustery, wild, grey day outside. Even in those moments of sunshine breaking through, the clouds are so grey and foreboding, like something out of an old movie, Hitchcock or maybe Rebecca, that it is making feel all moody and forlorn. I should be doing some more work on the next novel in my new series, the Witch-Were Chronicles, the first of which, Dark Moon, is out with Penguin’s Destiny Romance on March 15th. But after having spent all morning crouched over my screen, redrafting 3 chapters of Healer Moon, (I’m now 3/4 of the way through) my brain is exhausted and my fingers numb and toes are numb (the house is suddenly cold after having been blisteringly hot for most of the last month) and I have a yearning to just sit down in my comfy armchair with a cup of tea, a bunny maltezer and my heatbags and watch how the classics handles the ultimate romance. When my friend, Helen, was down a few weeks ago, I discovered that she had never read any of Jane Austen’s stories, nor had she seen any of the movies or tv adaptations. You can imagine I was suitably horrified – horrified that she’d never experienced the grace and passion of Austen’s world and loves, but that she hadn’t seen the ultimate in tv experiences, and also a little horrified that I never knew this. She is my best oldest friend afterall. Giving wet t-shirt competitions a whole new meaning. 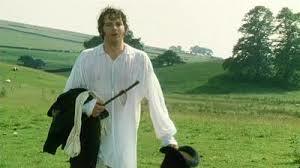 I’m also not quite certain what rock she must have been under when Colin Firth slipped on Mr Darcy’s tight buckskins, defrocked and dived into that lake, making all female kind wild to see a dashing man with a wonderful physique in wet white linen. Eye candy indeed. So, we started watching Pride and Prejudice and she laughed and enjoyed, but alas, only got through half of it. She flew back home after watching the notorious first proposal scene where Elizabeth Bennett set him on his ear by rejecting him and taking him to task for his less than gentlemanly like manner. Of course, you can’t stop P&P there. I’ve been hankering for the last 2 weeks to continue on and see it through to its contained yet passionate end, where love conquers manners and sees the pair loved up and married in the end and everyone else where they should be. So, today, when I have the weather blues, I am telling myself to be satisfied with the work I did this morning on my current WIP and just enjoy a love story worthy of making a romance author swoon. I wonder how many of you out there do something similar? I’d love to hear about what you do with the weather blues. I don’t know what you’re talking about, Liz. This isn’t writing. It’s just ambling thoughts (while watching P&P). Wet linen???!!! How is it that we didn’t get to that part? Please send the DVDs ASAP so I can rectify this horrible void in my voyeuristic education. I promise to sit in my big squishy armchair and pretend you are here while I catch up…..
You’ll have to come back down so we can watch it together. We can enjoy the wet linen and eat tomatoes.